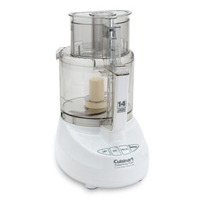 The rounded design of this Cuisinart model’s base adds an attractive touch to an already sleek food processor. The large capacity of the work bowl holds up to 3 pounds of dough for easy bread making. A good design feature is the wide feed tube, which allows you to drop in whole fruits and vegetables, saving you time cutting them up in advance. The touchpad controls are thankfully straightforward, labeled on, off, pulse, and dough. Overall, this Cuisinart food processor is a powerful behemoth capable of handling all the tasks you throw at it, all for $234.95.